The International Conference on Cancer Nursing (ICCN 2017) was held in Anaheim, CA, USA with the theme ‘Merging Research and Practice across the Globe’. In total, five nursing staff from Zhejiang Cancer Hospital of China attended the conference, including Wan-ying Wu, Zi-fang Jiang, Yi Tu, Guan-mian Liang, and Xia Shen. Four delivered oral presentations, one was poster presenter. This multidisciplinary team was comprised of nursing managers, medical professionals, administrating experts who actively participated in the whole process. What was shared regarding cancer clinical practice, administration experience, as well as research findings were highly appraised and was a great deal of interest to each of them. The following is a short interview of their experience at ICCN 2017. Interviewer: Hi guys, what do you think of this conference? Wu: I was really excited about this meeting. It remains one of the most important opportunities for cancer nurses across the globe to share our experiences and network. This is an amazing program which highlights how cancer nurses’ advance and continue to interpret evidence into practice. 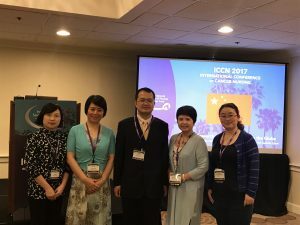 Jiang: This was actually the second time I have attended ICCN. The highlight was meeting acquaintances and making new friends and colleagues to collaborate with. My topic was “The qualitative research of sexual status in breast cancer patients”. Liang: My presentation was focused on “how to motivate nurses on continuing nursing education”. I attended seven presentations including professional issues, methods /measurements/tool development and quality & safety. They were all very interesting and I feel I really benefited a lot by attending ICCN 2017. Tu: This was a fabulous chance that I could exchange ideas on cancer nursing with other representatives who were engaged in the same research areas. Shen: I was so honored and excited when I received the invitation from the Conference Organizing Committee as an oral presenter. I could share what we’ve done for our patients with cancer nursing experts from all over the world. I suppose it will be one of the most unforgettable memories for me. By having access to the cutting-edge advances in cancer care, I was able to broaden my horizon and seek cooperation opportunities with other delegates in the future.